Heat & eat! Naturally skinny 198 kcals per pot. Delicious soup with traditional veg. Beat this blooming delicious soup! No added sugar. 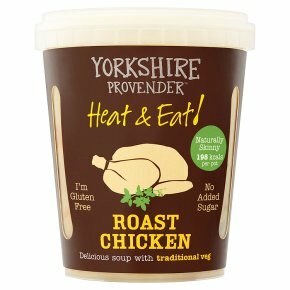 I'm gluten free.This is our take on the classic family favourite, roast chicken with traditional vegetables. Great for a delicious, quick lunch or supper, it's the ultimate comfort soup. We take great care to remove all bones; occasionally one may remain. Heat gently, stirring occasionally until piping hot. Please don't boil. Remove lid and replace lightly: 750W 5 mins/850W 4 1/2 mins. Stir halfway through heating. Allow to stand for a minute or two. Careful, it's hot!